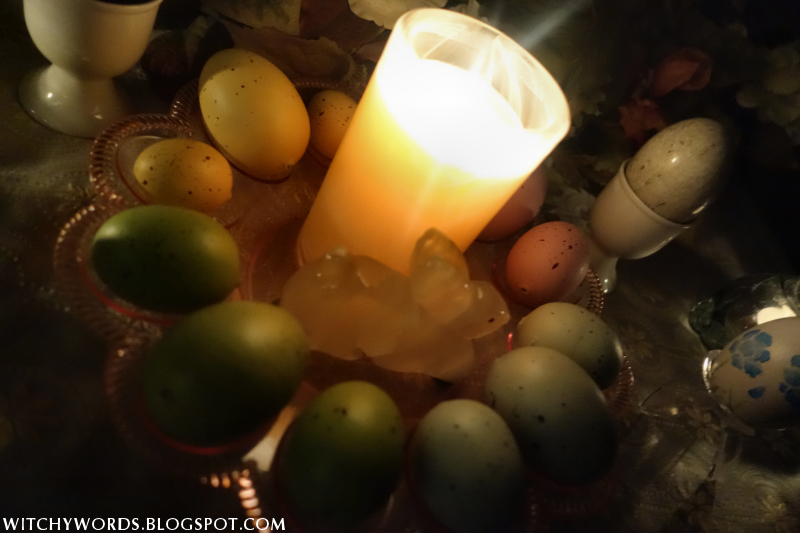 This post will cover the Spring Equinox / Ostara 2014 celebration and ritual by the Circle of Northern Fountains. 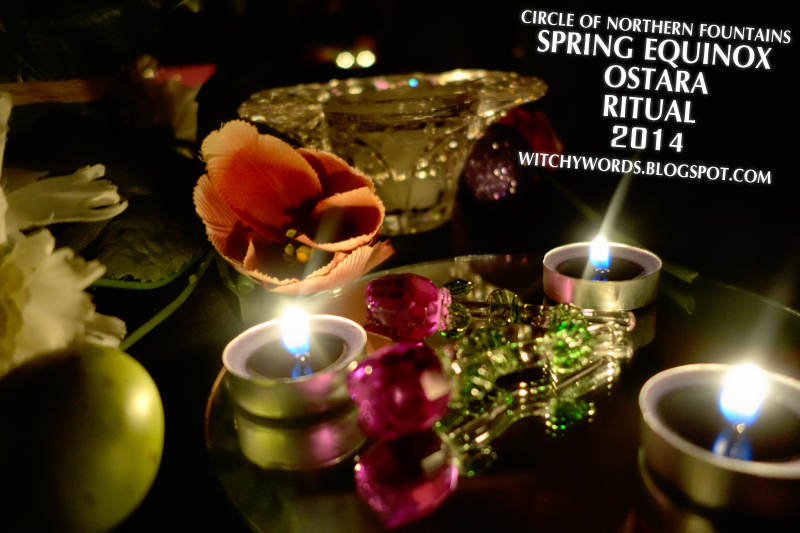 To see the Circle of Open Traditions Ostara 2013 ritual, click here. 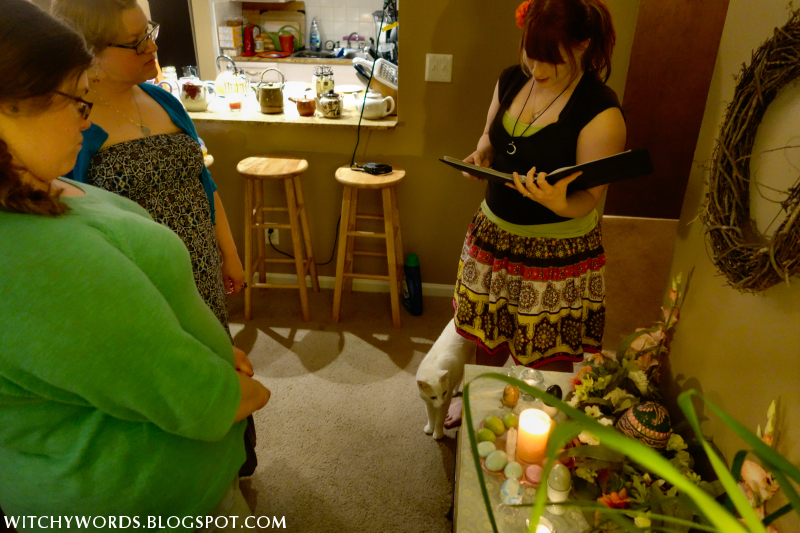 The first portion of the ritual included lighting the altar and reading a short poem. For more details on the altar, including a visual description, click here. 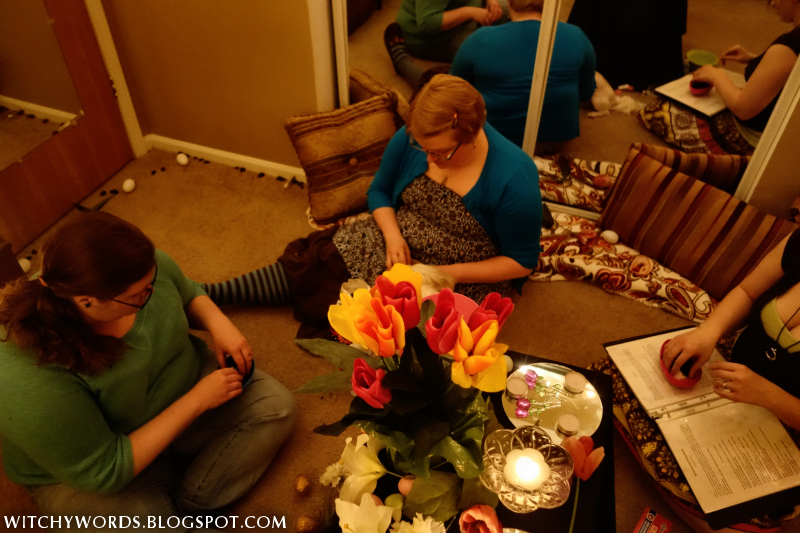 Since Ostara is our first ritual together as a circle, we kept it to just the full members - those who have rolls such as Coordinator, Recorder or Auditor, and those who will be taking on writing, hosting and financing rituals. Our final total in the group is six members at the moment, but we're growing! 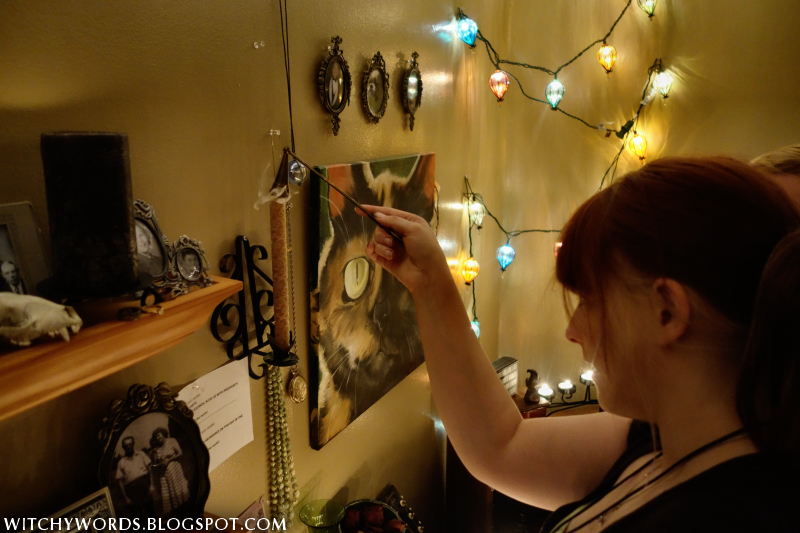 Also notice one of my familiars, Hermes, getting in on the altar lighting action up there. 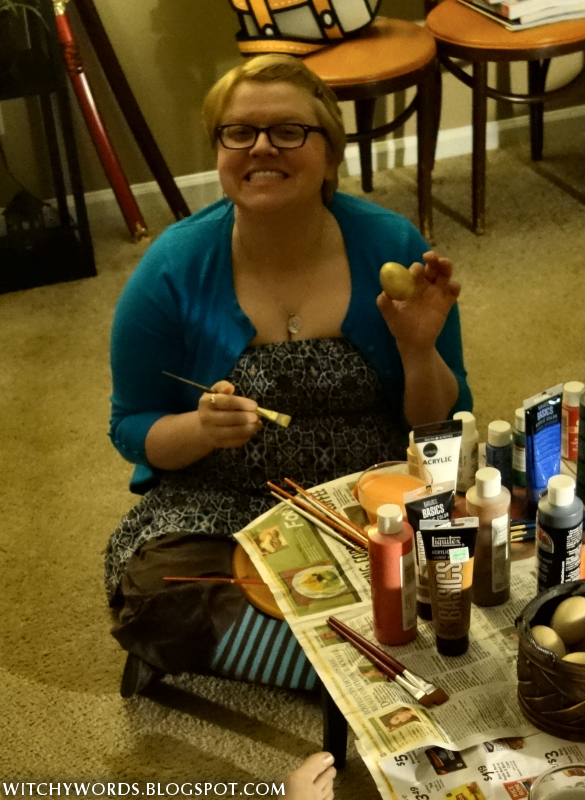 Our activity this year including painting craft eggs and chatting about Circle Customs and Regulations. 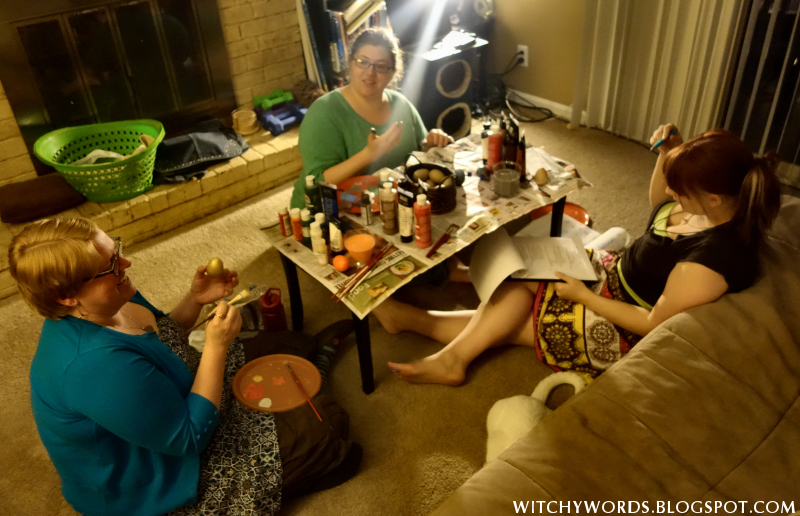 We also finalized our name during this session. Circle of Northern Fountains refers to our location. Kansas City is known as the City of Fountains, and we're located north of the river. 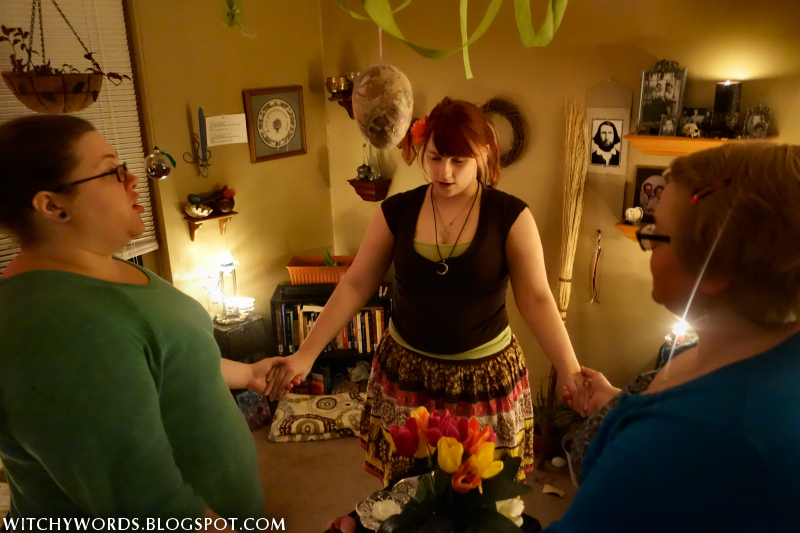 After lengthy discussions about how the circle should be ran and properly dividing up the responsibilities of the group, we headed to the spiritual room for ritual! 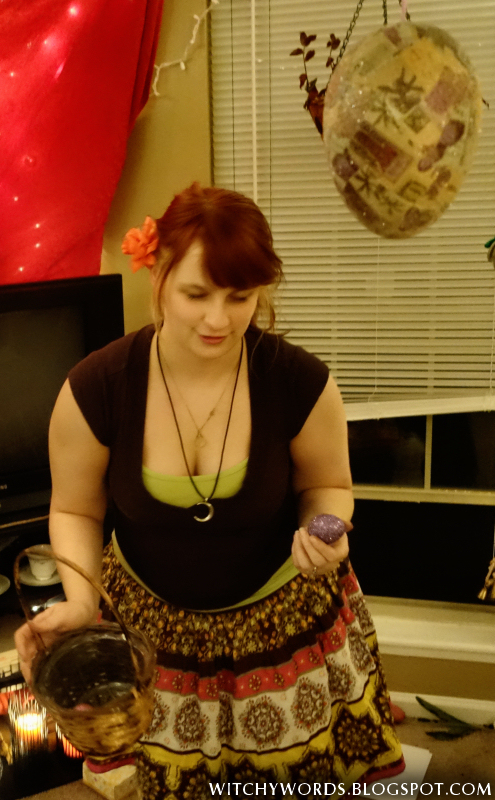 Before opening circle, I prefer to light all the free-standing candles and tea lights in the room. It simply sets the mood. There are almost 40 of such candles, but we take all the proper fire precautions. Safety first! As you can tell, I've busted out the proper Spring Equinox decorations this year. 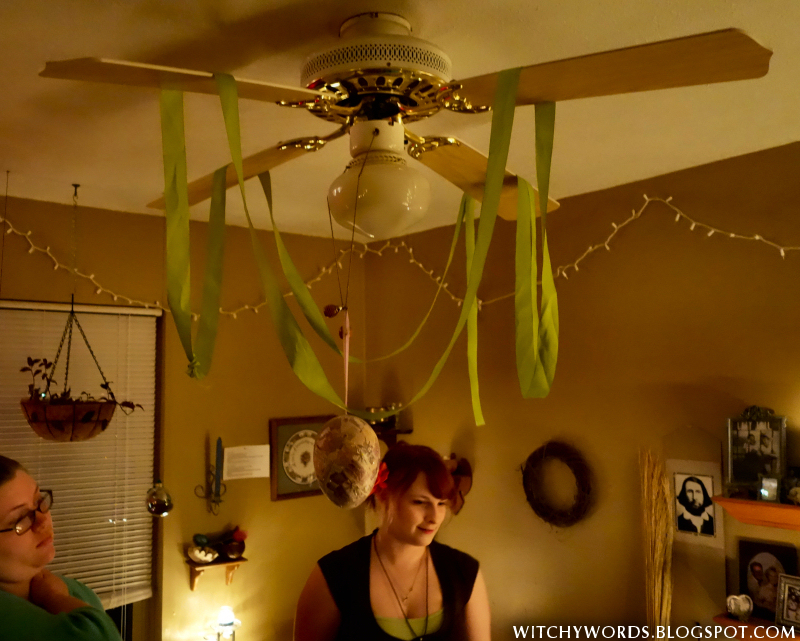 I like to use the ceiling fan (lightly) as a decoration chandelier. It does the job. The forty free-standing candles doesn't include the four corner candles or the center-most candle. Nor does it include any candles we may light for spell work. 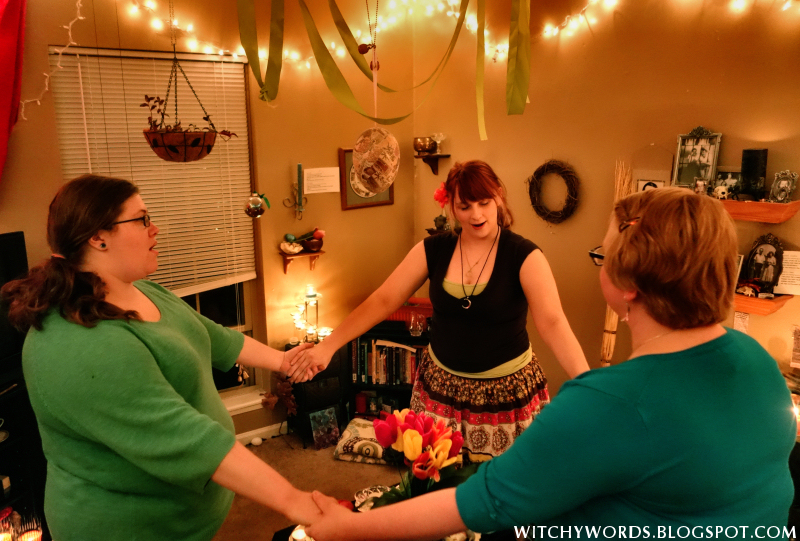 After calling upon corresponding energies, spirits or deities whom each person associates with that holiday, we then dive into celebration via spell work. 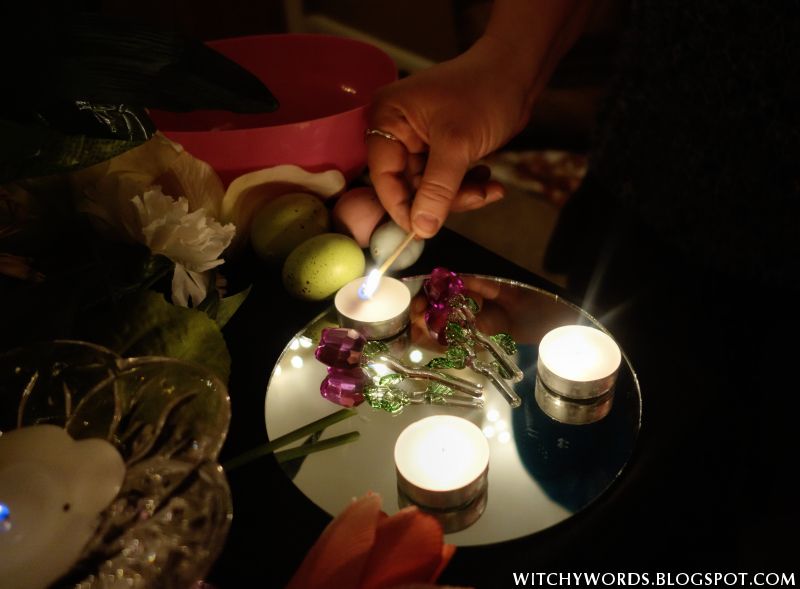 The first step of the Spring Equinox ritual is to let go of something that's been holding you back. 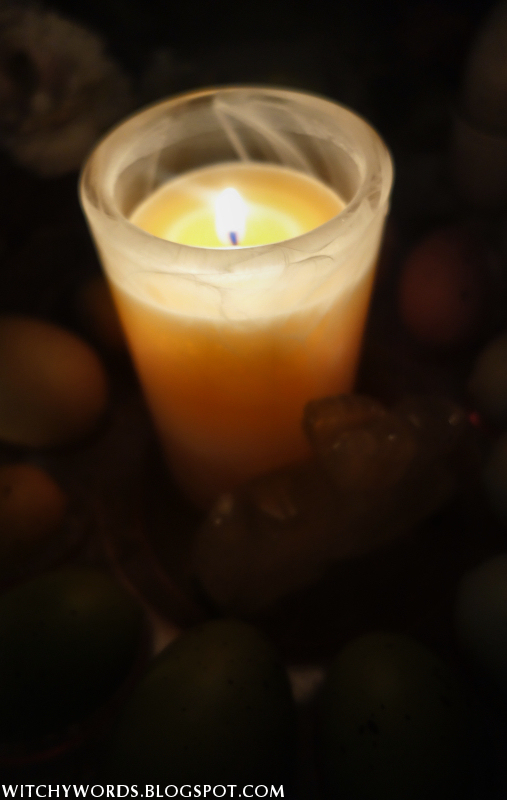 Each person lights a black candle while stating what it is that they'd like to remove from themselves. ... and buried the shell in potting soil. Just as the dying leaf fertilizing the soil, letting new life grow in its place, the eggshell empowered with our will to remove negativity fertilizes the soil to bring something new to our lives. 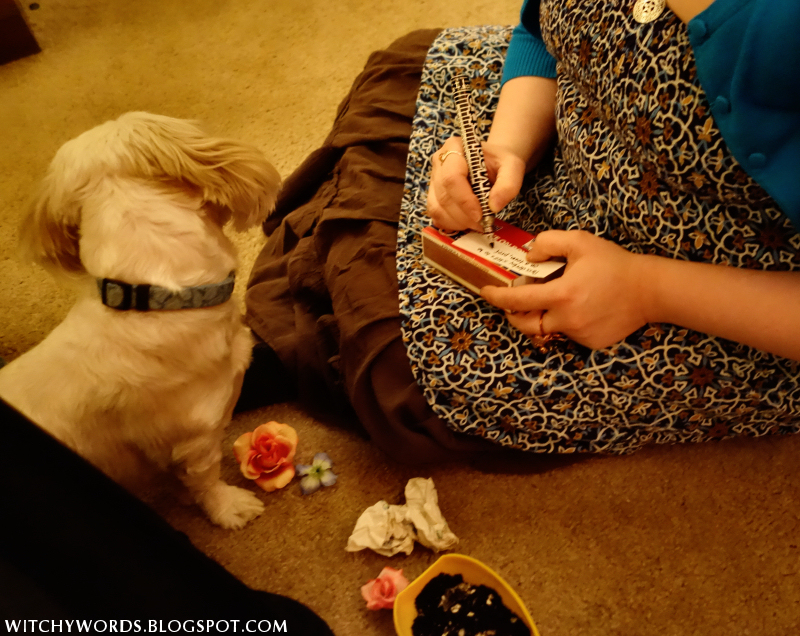 My dog Artemis, a familiar as well, was intrigued by this spell. Something tells me he'd like to play in the dirt too. And just exactly what would you like to bring into your life? That's the next step of the spell! 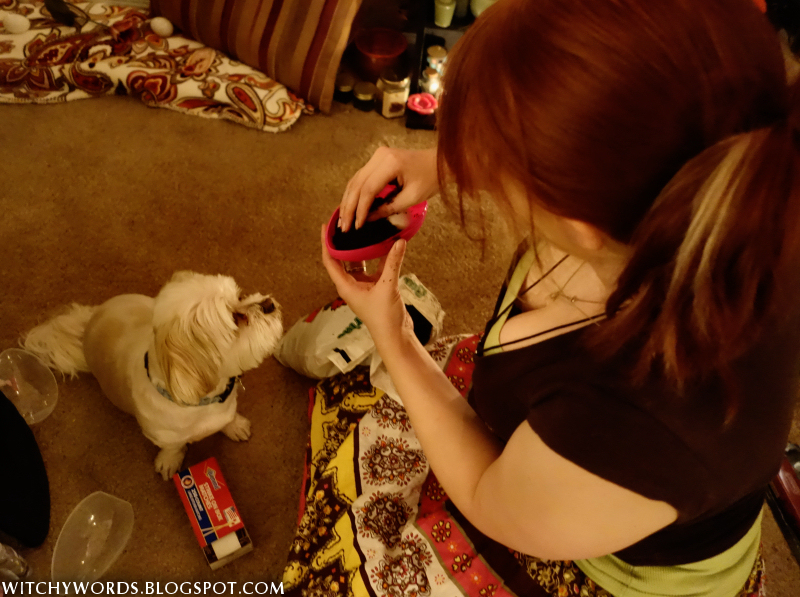 While lighting a white candle, we talked about something we would each like to accomplish within the next few months. Following that, we wrote those goals on a slip of paper and folded them into a ball. 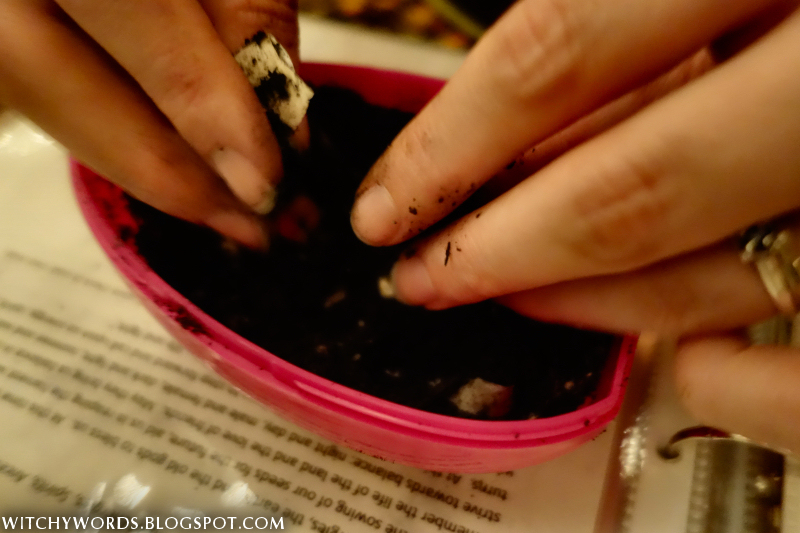 We then planted the pieces of paper in the eggshell-fertilized soil. The paper now represents a seed - a new budding life. By fertilizing it with the eggshell, imbued with the desire to let go, we now allow something new to grow into our lives. 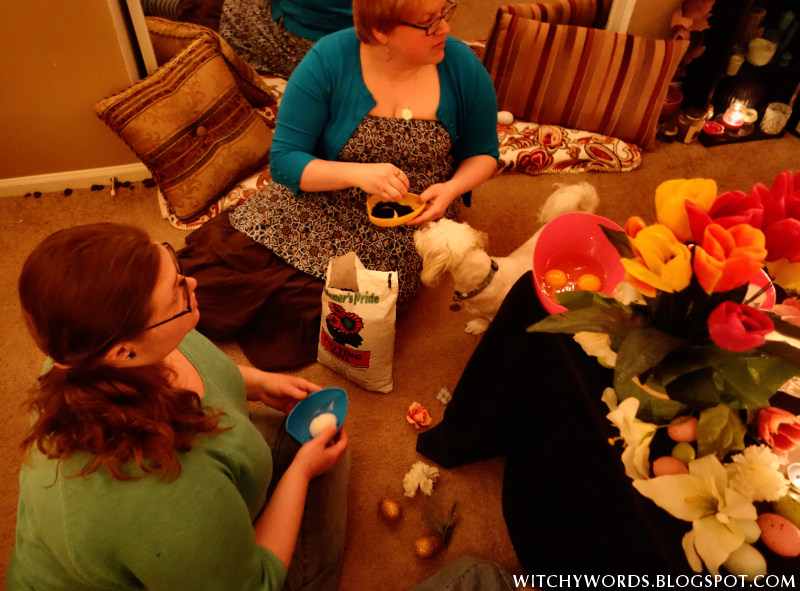 The final step of our ritual was my Ostara Gemstone Fortunes! If you want to learn more about how to put these together, click here! 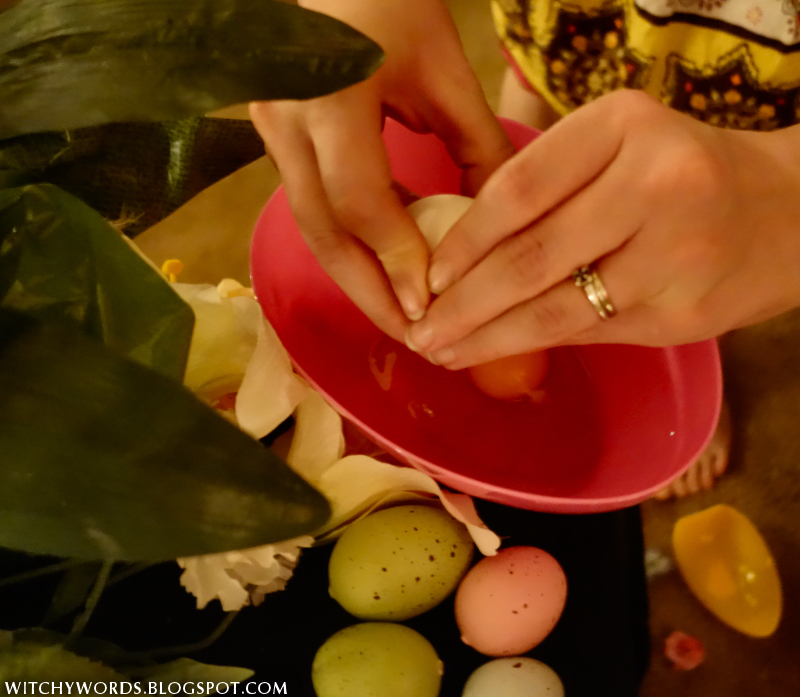 Each person selected one egg at random from the basket. 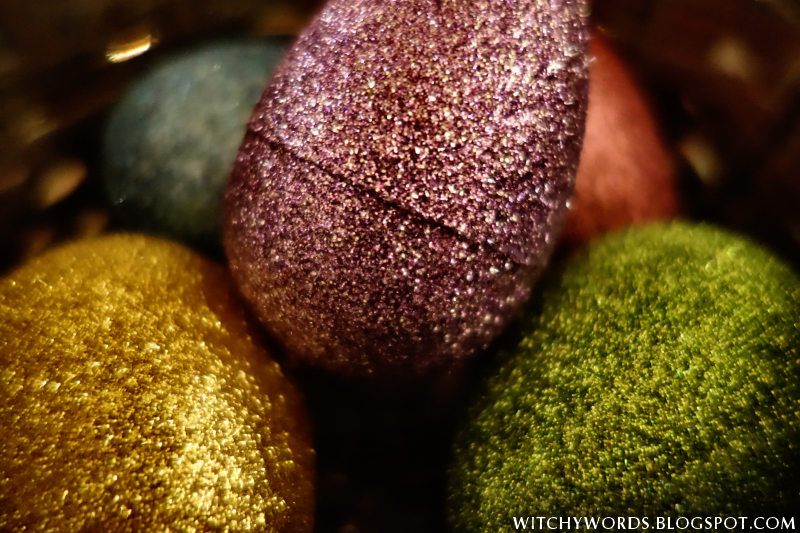 Inside the egg was a gemstone and a slip of paper with two properties that stone was charged with. This year, I drew creativity and strength through Carnelian. Last year, I focused on family and protection with petrified wood. ... and closed the circle. 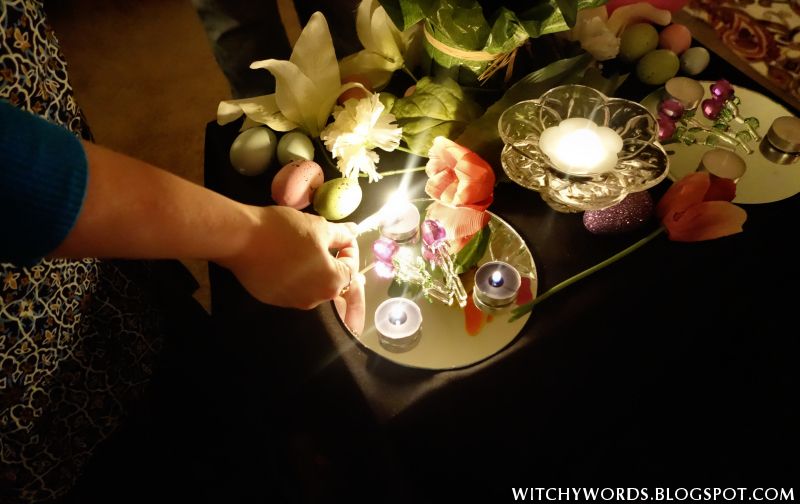 And that concludes the Circle of Northern Fountain's Spring Equinox / Ostara ritual for 2014! 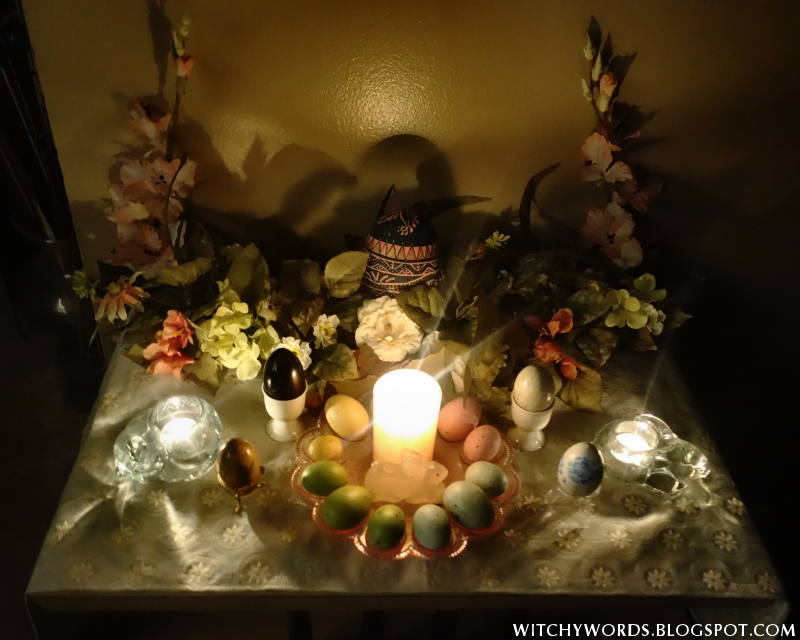 To see Liithi Lushede Coven's public Ostara ritual, click here! 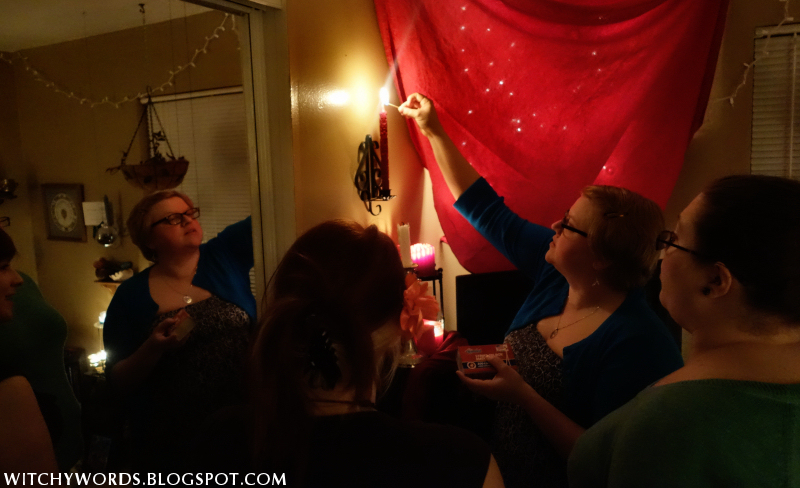 To see the previous sabbat February Eve / Imbolc, click here!